jozjozjoz.com :: brain barf... yum! : I'm in love! Yoshi found him last night while surfing petfinder. He's coming out to Brentwood tomorrow. Too bad we can't have dogs where we live now. 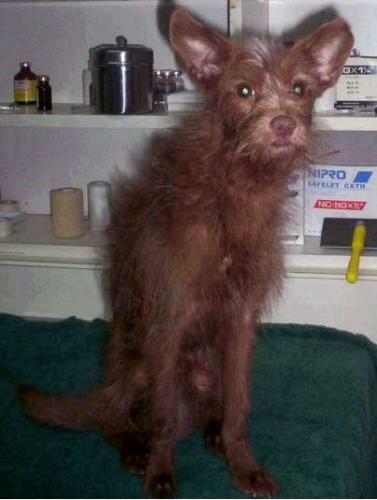 Rescued from a high kill pound, Rusty is a very unusual looking boy- Terrier and Powerderpuff Chinese Crested is our best guess as to his breed, but who knows- all we know is that he's VERY UNIQUE, and SO SO SWEET! , His cute looks and great personality has already turned plenty of heads! And at 10 lbs and 4 years old, he's just a perfect dog in every way! Rusty is well behaved, quiet, and would do great in an apartment setting, provided he could go for his favorite passtime every day- his walks! Rusty would prefer to either be an only dog, or just have a female dog as his "sister". He is healthy, neutered, and ready to come home to you! Come see Rusty this weekend at our adoption event in Encinitas this Saturday, 3/6, and Sunday 3/7 in Brentwood, Los Angeles! More details on our homepage! Rusty is available to be seen daily in the San Diego area. If you are interested in coming to meet him, please fill out an adoption application and email or call us! Rusty can't wait to come home to you! Adoption fee includes spay/neuter, initial shots, microchip and free vet visit. Awww love the scruffy pooches.